The latest manufacturer to announce a big shift towards electric and hybrid cars is Daimler, parent company of both Mercedes-Benz and Smart. It has said it plans to spend €5.4bn on research and development over the next two years, much of it earmarked for a new wave of cars with motors and batteries. Some of that overall investment will go towards improving the efficiency of the petrol and diesel engines that still make up the vast majority of the group’s output, but the next couple of years will also see the arrival of new electric, hybrid and hydrogen-powered options. With heavyweights like the plutocratic S-Class on its books, plus lots of fire-breathing AMG models, Mercedes will need plenty of highly efficient cars to help it meet EU emissions targets. It has to hit a 95g/km average across its fleet by 2020 to avoid painful fines. 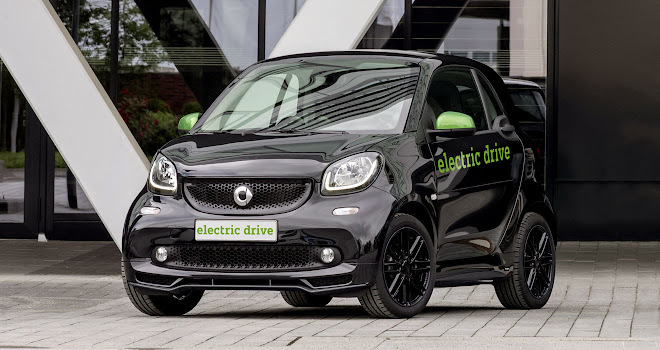 Among the first fruits of that effort will be fully electric versions of the current Smart ForTwo and Cabrio, replacing the current old-shape ForTwo ED. Engineering similarities between the ForTwo and ForFour also mean we will see a four-seater EV from Smart for the first time. The new electric models will go on sale in Europe in early 2017, after a stint spinning on the turntables of the Paris motor show in September. 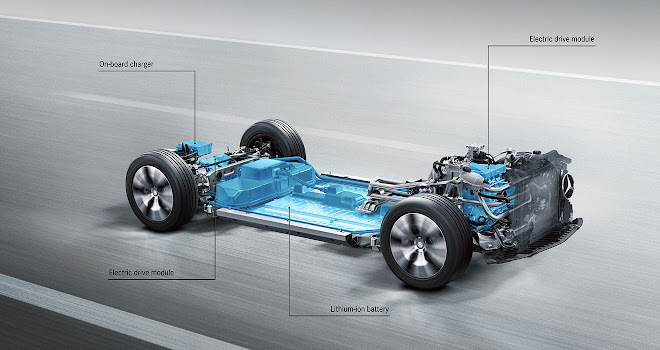 In addition, a new dedicated electric vehicle platform is being developed to underpin future electric Mercedes cars – a shift away from squeezing a battery and motor into a model primarily designed for an internal combustion engine, as with the B-Class Electric Drive. This move should help Mercedes to better compete with electric-only designs from the likes of Tesla, BMW and Porsche, among others. The first cars built using the new EV platform are due to arrive before 2020. 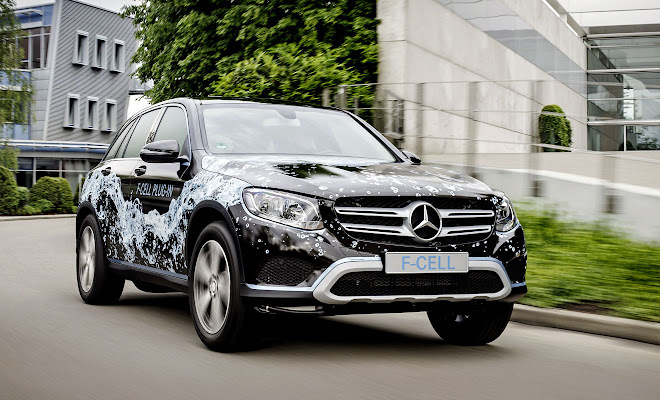 Before that, the company has promised to put a hydrogen fuel-cell car on sale, with an F-Cell edition of the Mercedes GLC off-roader joining the hydrogen-powered Hyundai ix35 and Toyota Mirai on the market next year. But the Mercedes comes with a twist. The GLC will be a plug-in hybrid, combining hydrogen fuel-cell technology with a substantial lithium-ion battery, charged from the mains. While both the Mirai and ix35 do feature lithium-ion batteries, they are relatively modest in capacity, serving much the same role as batteries in non-plug-in hybrids like the standard Toyota Prius. 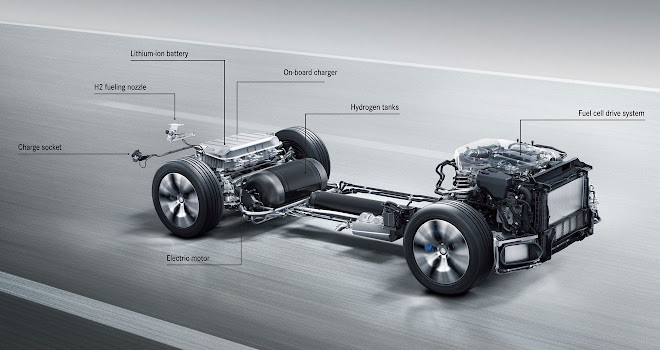 The battery in the plug-in GLC will boast a capacity of around 9kWh, in the same ballpark as today’s petrol-powered plug-ins like the Volvo XC90 T8, BMW X5 xDrive40e and Volkswagen Passat GTE. 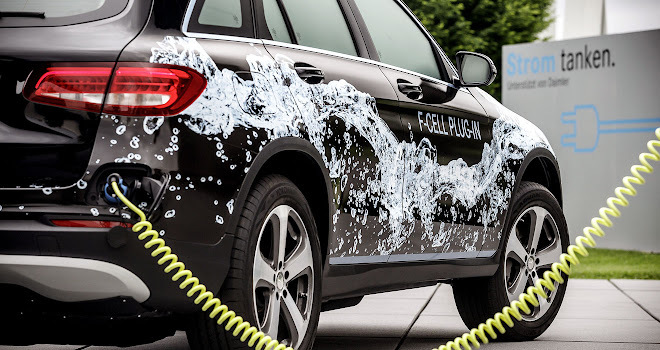 This will give Mercedes’ hydrogen car the ability to travel up to 50km (31 miles) on mains charge alone. 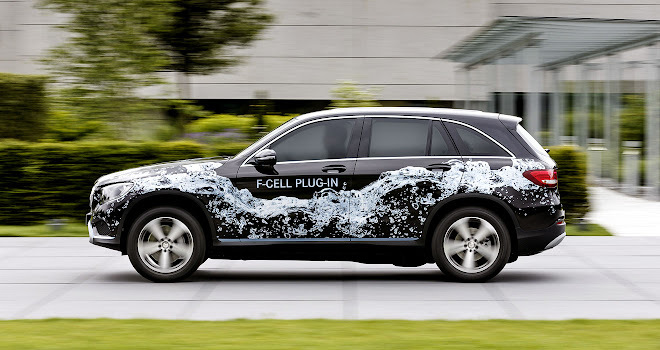 The battery will also allow the GLC to manage with smaller hydrogen tanks than its rivals. When filled to their 700 bar peak pressure, the car’s carbon-fibre tanks – one under the rear seats and another in the centre tunnel – will hold just 4kg of hydrogen, compared with 5kg for Toyota’s fuel-cell car and 5.6kg for Hyundai’s. Mercedes says the combination of battery and hydrogen will yield a combined range of about 310 miles. In the longer term, Daimler says it hopes to extend the range of hybrids and EVs alike with better batteries. It already makes its own batteries via a subsidiary called Deutcshe Accumotive, and the company says it believes lithium-sulphur batteries will become mature enough for road use over the next decade, supplanting today’s lithium-ion chemistries. The switch could yield twice the energy density for half the cost, according to Daimler, meaning more affordable EVs that go further than today’s models. In the meantime, Mercedes aims to make it easier to charge today’s batteries by building in support for inductive charging. This avoids the need to plug the car in to recharge – instead the driver simply needs to park over a charging pad installed in a parking bay or (more likely) fitted at home in a garage or driveway. The facelift model of the Mercedes S500e, due next year, will be the first to feature this approach. Wireless energy transfer of this sort is about 90% efficient and will charge at 3.6kW, Mercedes says. That’s comparable to the charging rates of today’s wallboxes – a bit quicker than a three-pin plug, in other words. 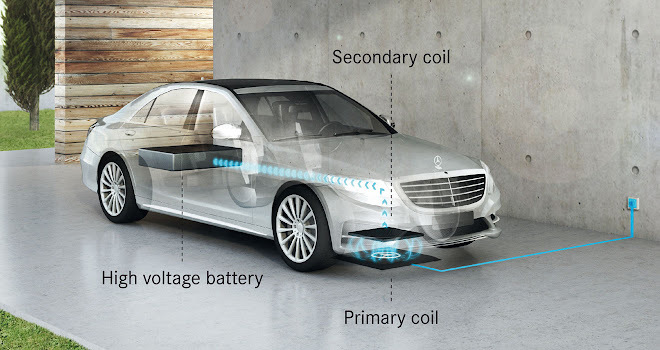 From 2018, direct-current charging based on the CCS (Combined Charging System) standard will be supported by Mercedes, allowing much faster charging away from home for those owners who can be bothered to lift a cable and plug the car in. Even ostensibly normal cars are set to benefit from improved electrification, with changes that Daimler says will blur the division between hybrids and conventional cars. As early as next year, Mercedes will begin the introduction of 48-volt rather than 12-volt electrical systems. This quadrupling of the car’s basic voltage unlocks a range of improvements that are hard to achieve with today’s less powerful car batteries, such as smooth and seamless engine restarts. Anyone who has driven a hybrid car, which will feature a high-voltage battery of 120 volts or more, will know that the engine start ups are often barely perceptible, whereas most start-stop systems fitted to ordinary 12-volt cars are anything but – a loud whir, a chunk of harsh vibration and dimmed lights often accompanying every restart. Mercedes plans to add 48-volt integrated starter generators (ISGs) to its larger cars and belt-driven starter generators (RSGs – the German word for belt starts with an R) to its smaller engines. Both options add a powerful electric motor that can start the engine smoothly, assist during acceleration and recover energy during braking. Either will also make it feasible to switch off the engine whenever the driver releases the throttle, rather than waiting until the car draws to a stop. The ISG option, positioned between the engine and gearbox, should also be capable of propelling the car without disturbing the engine, allowing drivers to set off or manoeuvre at low speed on electric power alone. Mercedes’ first ISG engine will be a 3-litre, six-cylinder petrol unit, due next year, that the company says will set new benchmarks in efficiency for the firm’s larger cars (plug-ins and current hybrids aside). A four-cylinder engine with an RSG is due to arrive in 2017 as well. Mercedes also plans to tackle a lesser-known problem of downsized petrol engines, some of which can emit appreciable quantities of the microscopic soot particulates that are usually associated with diesel engines. The company plans to add particulate filters to petrol engines, to trap the bulk of the soot, as is done for diesel cars today.